Great Britain's Jeanette Chippington has become the second GB paddler to complete the season Grand Slam of major Para-canoe titles by winning world gold in the Czech Republic. Chippington, in the KL1 class, added the medal to her Paralympic and European titles in Racice. She follows Emma Wiggs, who completed the set on Friday in the KL2 event. In the men's KL3 event, Jonny Young added bronze to the gold he won in Friday's VL3 final. Chippington told BBC Sport: "Last year I lost my world title and took silver so to get it back is pretty nice. "Completing the Grand Slam is and incredible feat because it's pretty hard to do and you can only do it every four years." 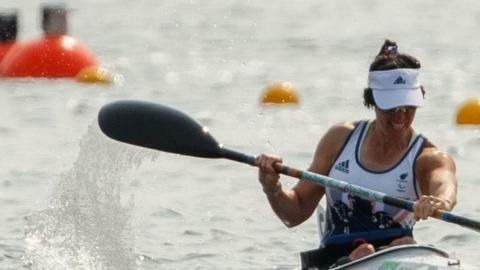 The 47-year-old has now won five Para-canoe world golds and also won six in Para-swimming before switching sports. Chippington is a veteran of six Paralympic Games, competing in her first as a swimmer at Seoul 1988 and winning her first gold medals at Atlanta in 1996. And she says after more than two decades she says has no problems trying to motivate herself to continue. "It's easy, I just love getting out on the lake and pushing myself to be the best every time. "It's been quite tough this year, but we've only got three years left now to Tokyo - that's definitely going to be my aim."